Returning in the past couple of months from the humidity and heat of Singapore, Jakarta and the beautiful summer weather in New Zealand and Australia to the signs of Spring in the UK with Easter on our door step, I look back with amusement at the jolly mixture of experiences we had from Indonesia to NZ and a variety of cities of Australia taking in how diverse each city was with its architectural mix of the old workman cottages with their lacy iron work lining the roofs in Sydney mixed with the fast growing modern buildings, some in playful shapes and brilliant color schemes, the trolley cars embroidering their way though the muraled streets of Melbourne to the colourful roofs resembling party invitation envelopes laying on the hillsides of Hobart in Tasmania, then the contrast of the sterile sky scrapers of Surfers Paradise which left us a bit cold, but we feel rich from the experience of working with all the different shops visited and the participants who joined us. It’s always a thrill to hear and see that some of the workshop participants got on with their quilt arrangements and finished the quilt they started in class. So that is a very satisfying feeling indeed. If anyone is passing though London, it’s well worth making time to visit the Royal Academy Art Gallery where there is a sumptuous exhibition, titled Painting the Modern Garden: Monet to Matisse. 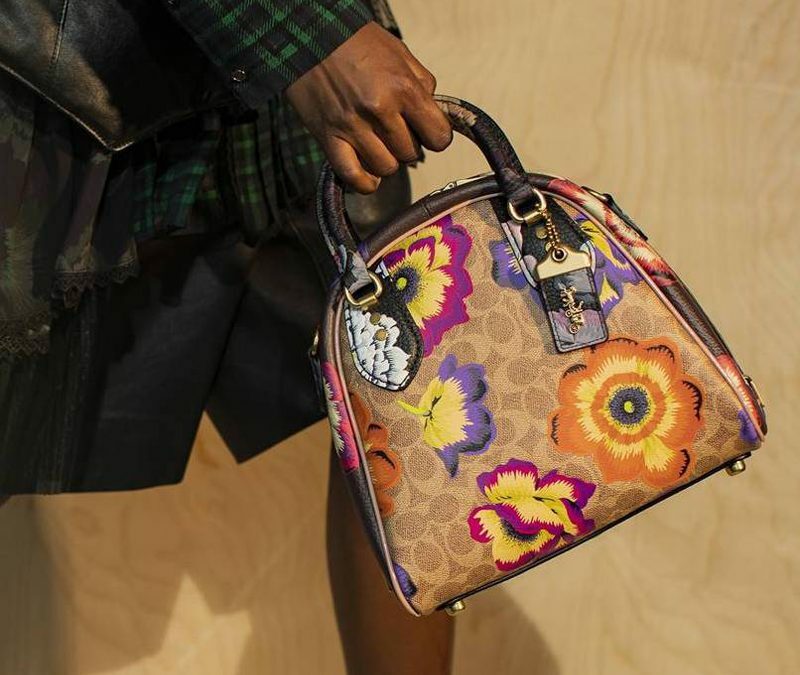 Whilst we were away, a new Creative Director for Westminster Fibers and FreeSpirit has been appointed. We are delighted to announce that Donna Wilder has taken on the task. Donna was the founder of ‘FreeSpirit’ before it was bought by Coats so has worked with many of our designers and we welcome her as team leader. Rowan Yarns, who we have been loyally designing for many years, are no longer part of the Coats company. They are now part of a German handicrafts company called Mezcraft. so a management shakeup and re-shuffle has taken place. We look forward to seeing how the company grows. Their web still remains as www.knitrowan.com. 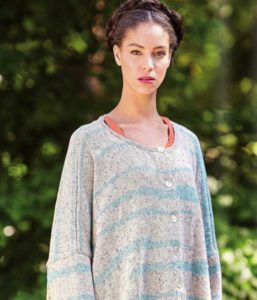 My latest design for Rowan can be seen found in an e-magazine from Rowan. My new ranges of fabrics are being shown to the shops as we speak with new colourways on some of Kaffe’s designs from the last collection. One of my new designs is called ‘Migration’, sort of like a mass migration of birds over an exotic landscape. Another design is called ‘Elephant Flower’ the clue is in the name – it’s a large oversized flower which cuts up a treat, then there is ‘Jazz’ a fun multi stripe and others, so I hope you will find something there to tease your imagination. There are new colourways on Kaffe’s Guinea Flower, Button Flowers, Striped Heraldic and the fabulous Strata stripe too. More can be seen on our websites. Philip Jacobs has just been to the studio for his once a year visit for Kaffe to make a selection for Philip’s next range of fabrics for Kaffe to do colourways. 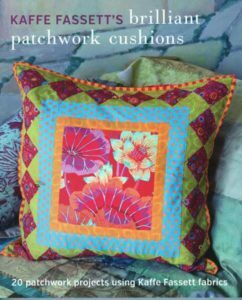 Following the success of the small projects patchwork book titled ‘Brilliant Little Patchworks,’ we released a book titled ‘Brilliant Little Patchwork Cushions and Pillows’. 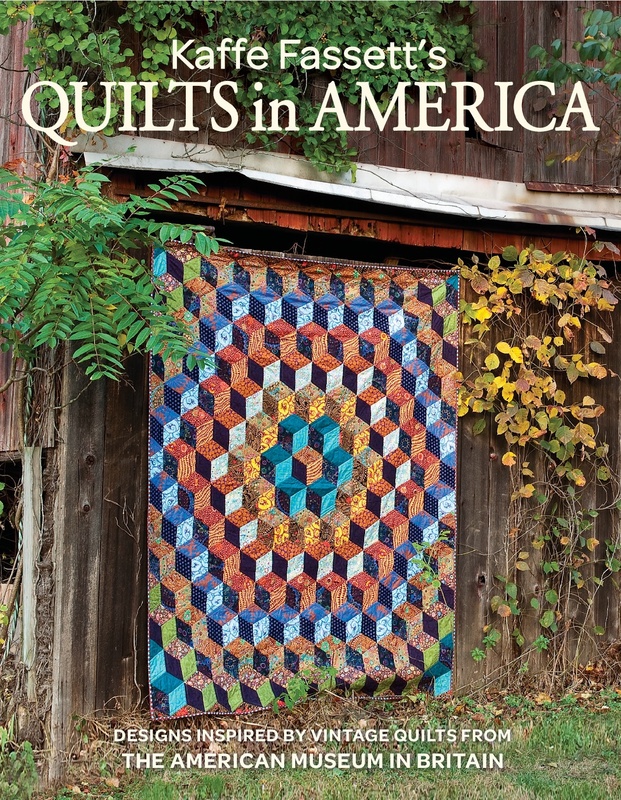 These straightforward projects are ideal for those who are just getting into the Kaffe Fassett Collective fabrics or don’t have a lot of time, or to make with young folk too. The projects use the Kaffe Fassett Collective classic collection, so the fabrics are still around. The Kaffe Fassett Fragrance Range, ‘Achillea’ has finally been launched in the USA, available in Ulta stores nationwide and online too – see here for US customers or here for UK customers. Look under ‘Heathcote & Ivory’ on their search engine when looking on the Ulta website. We have extended the range by introducing a scented candle in a decorated glass case, so it look like a Roman Glass fabric in stained glass. There are room infusers and also adorable toiletry bags in two different sizes. 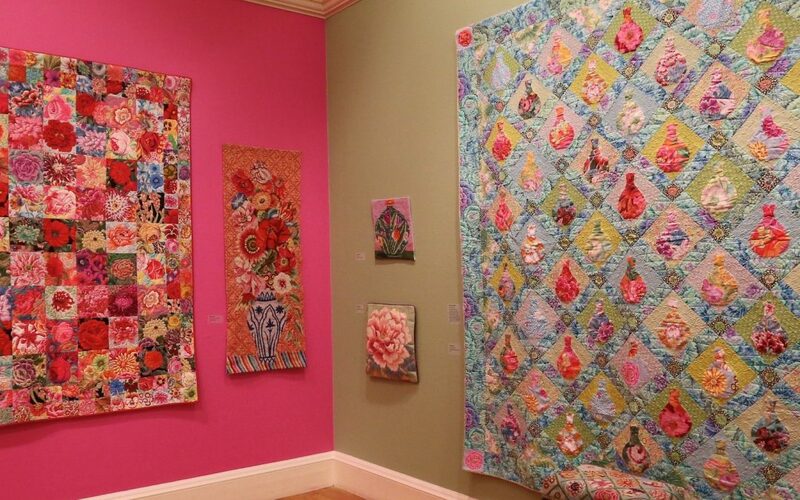 Kaffe’s ‘Blanket Statement’ quilt exhibition, which travelled from York Quilt Museum, UK to Houston Quilt Festival then onto the Michener Museum, Doylestown, PA, has now opened at the San Jose Quilt Museum, CA, on the 12th March and will be on exhibit for 3 months. 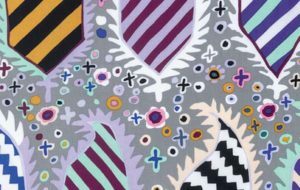 Along with this exhibition, the Museum have borrowed a rarely seen collection of one of a kind pieces of work by Kaffe from a client and friend, Zoe Landers and family members too. Kaffe will be giving a lecture and walking tour of the exhibition on the 21st May when he makes a visit back to his family home in Big Sur, CA. Tickets are limited so book early. 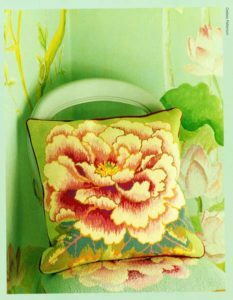 Due to popular demand Ehrman Tapestry kits have re-released Kaffe’s ‘Floating Peony’ needlepoint cushion; also Kaffe has done a jolly range of bright geometric cushions in solid blocks of colour – ideal for beginners – see link here, Peruvian Connection have a gorgeous ready to wear design garment from Kaffe called Mardi Gras. In the meantime, Kaffe is working on new colourways for his fabrics and Philip Jacob’s new fabric designs, while I’m finishing off my next collection of prints. Funny to think that these designs then won’t be available till next spring 2017. We are also in the throws of working with the wonderful artist and quilter Janet Haigh from Heart Space Studios, who has taken over the responsibility of sewing and putting together the instructions for the next Patchwork and Quilting book with her team of sewers, from Pauline Smith who had to take early retirement at short notice. 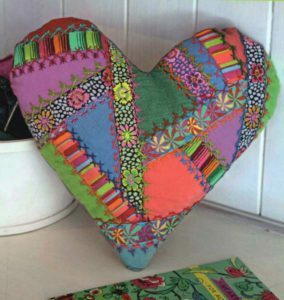 Janet brought out a lovely book late last year on using the Kaffe Fassett Ribbons titled ‘Little Ribbon Patchwork and Applique’ – it’s a charmer of a book. Please check our calendar events page on our websites to see for up and coming workshops. 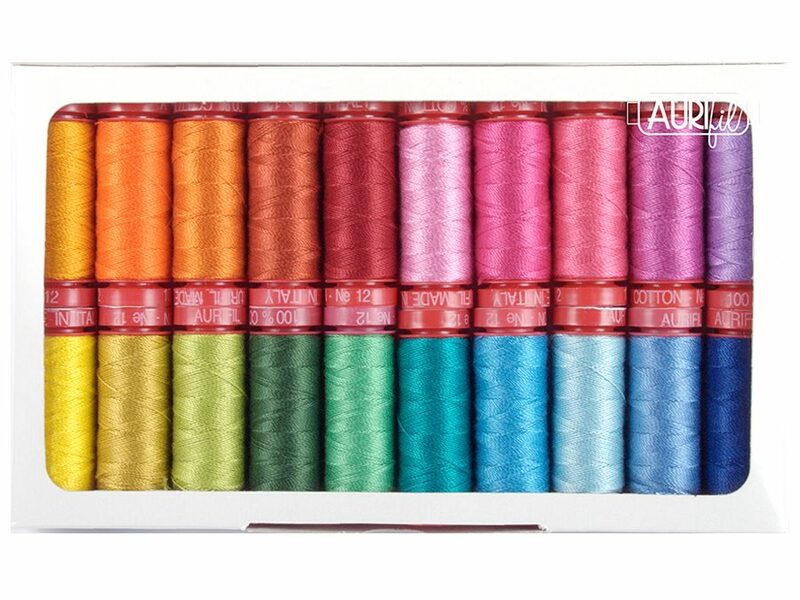 For instance, whilst Kaffe is in California with family, I will be giving two ‘Colour in Design’ patchwork classes and an afternoon slide talk in Golden, CO, USA and workshops in the UK later in the year. Embrace the new seasons and keep creating. 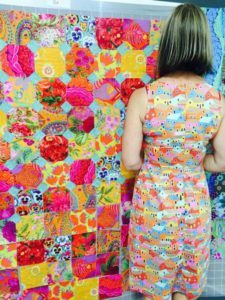 In the meantime, if you’d like to join me on Facebook under my name or the Kaffe Fassett Collective you’d be very welcome and on Instagram.